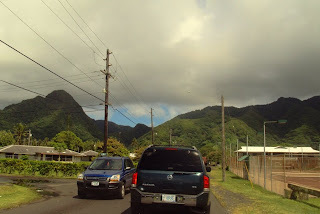 While my trip to American Samoa was conveniently timed so I could leave the day after all of my school obligations for the 2009 school year were fulfilled, that was not the reason for my trip. Nor was visiting Sarah, nor was the chance to see Tutuila, nor was it the chance to enjoy Carl’s Jr. My sole reason for going to American Samoa this weekend was to take the LSAT Saturday afternoon; beyond that, my itinerary was completely open, which was fine. I originally intended to fly out Friday night, but since our staff dinner was Friday night and the lady at the travel agency assured me the Saturday morning flight wouldn’t be delayed, I opted to stay. I got as much sleep as I could, knowing the test was the next day, and woke up just after dawn on Saturday and called for a taxi. The man on the phone sounded hesitant about sending a cab, and I was nervous about missing my plane, so finally I wandered out to the road and hailed a cab. This is a routine flight at the Fagalii airport on the outskirts of Apia, and they’ve become a well-oiled machine at getting people on the plane. Surprise! There’s a $30WST takeoff tax! Thanks, Samoa. I didn’t have enough cash, but it turns out the faleoloa across the street has a side currency exchange that offers terrible exchange rates to its captive customers. Oh well. Sarah emailed me directions to give the taxi driver to help me find her family’s house. Sarah herself was at a conference in Hawai’i, and I wouldn’t see her until late in the evening Sunday. 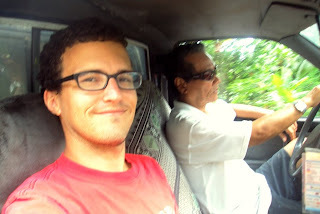 The taxi driver and I were able to find the house with relative ease. I’m pretty sure he overcharged me, and that was that. Walking up to Sarah’s house was not unlike approaching my host family’s house in Fausaga. In fact, spending the weekend at Sarah’s felt exactly like having a host family—with slightly more lax rules and higher quality TV. Her dad was expecting me, and acted as my host for the weekend. He made corned beef hash for breakfast on Saturday and then gave me the remote and told me to watch whatever I wanted. As I said in yesterday’s post, I engorged myself on the Top Chef marathon, occasionally changing the channel to catch Alabama upsetting Florida. It is mystifying to me that my parents don’t get Bravo! 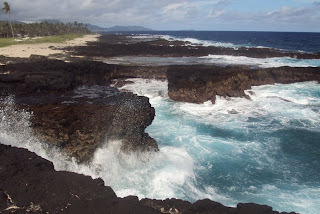 but in BFE American Samoa I can get episode after episode of Top Chef. Sarah’s friend Tia, who also happened to be scheduled for the LSAT, picked me up around noon. He was all freaked out because he’d had to do some unexpected chores for his mom that morning, and he hadn’t had time to print his test ticket. We stopped at an Internet café and got it done. We also stopped at a faleoloa (general store?) so I could grab a couple Capri Suns and a juice box of chocolate milk to replace my juice boxes confiscated by DHS before my flight. The test was okay. It lasted around 4.5 hours. Ick. I convinced Tia to stop at Carl’s Jr. on the way home. Between the relief of being finished with the test and the refreshing goodness of real ice tea, I was happy. Tia talked about taking me to a nightclub Saturday night, but he showed up late, and I didn’t pack appropriate attire. I ended up having a beer with Sarah’s uncle while we sat and admired the “waterfall” Sarah’s dad had recently installed in the backyard. Sarah’s dad was really proud of the waterfall. 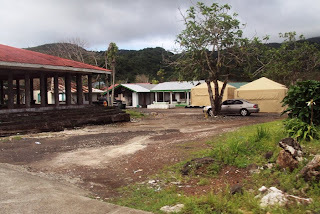 Sunday in American Samoa seems just about as dead as Sunday in Samoa Samoa. I ended up working my way through Sarah’s DVD collection. She recently rented “Doubt,” which was good. I finally watched “Big Daddy” 10 years after it came out. And then, in act of extreme randomness, I watched 12 episodes from Season 1 of “Martin”. The writing on the show is mediocre, but its reflection of the state of African American culture in the early 1990s is fascinating. When I write my book of essays on postmodernism, Martin will get a chapter. There was a brief interruption in the afternoon when Sarah’s uncle offered me a tour of the island, which I happily accepted. He took me to the original “Maliu Mai,” a resort with an eponymous counterpart in Samoa Samoa, which is owned by the same guy. We snorkeled and walked around the tide pools. Then we went to the Turtle and Shark cliffs (pictured above), where local children sing a particular song that attracts turtles and sharks. Except on Sundays. My loss. Sarah arrived late Sunday night, and we chatted about the state of Group 81 and reminisced old times. Sarah insisted she take the couch and I sleep in her bed—an arrangement I refused until she tenaciously fell asleep on the couch. Fine then. Monday morning I watched 3 episodes of a “Cash Cab” marathon while we waited for Sarah’s co-worker to come. The co-worker generously agreed to drop me off at the airport since he was giving Sarah a ride to work anyway—Sarah’s truck was a tsunami casualty. And thus my trip to American Samoa came to a close. One might say it was uneventful, but I’d also argue the slow pace of the weekend is emblematic of the lifestyle there, and what’s wrong with that? Unlike Apia, Pago has no concentrated "downtown" area. The whole thing is spread out. This makes for nice scenery, but difficult for getting around. I'd hate to have to run errands there. Me with Sarah's Uncle Tua. 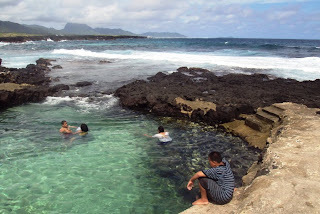 At the Maliu Mai swimming hole/snorkeling area. Tua took me to see Leone, a village hit pretty hard by the tsunami. You can see the relief tents in the distance. You came to the most beautiful island in the Pacific to watch TV? i bet the water was nice. tide pools look beautiful. PS isn't Top Chef addicting?